Dando Drilling recently returned from UK drilling exhibition Geotechnica in Leamington Spa. We would like to thank everyone who visited us and we found the show to be very successful. 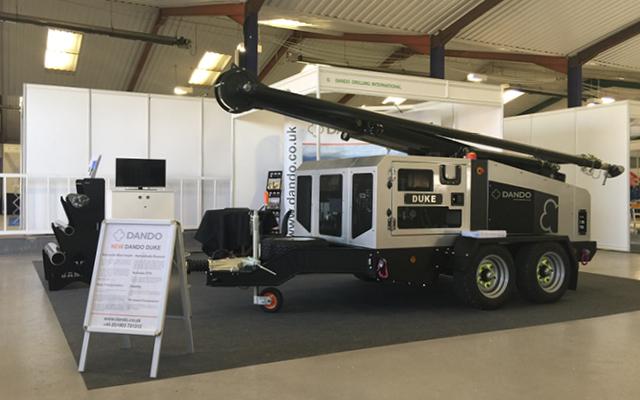 Our brand new Dando Duke cable percussion rig, presented to the public for the very first time, attracted a huge amount of interest and we were delighted to receive a lot of valuable visitor feedback on the rig. Boasting a wide range of innovative features for increased efficiency and productivity, the Dando Duke is our new cutting-edge cable percussion rig. Its hydraulically operated telescopic mast allows for a very fast and easy setup while a variety of mast heights allow drilling to be carried out in areas of restricted head room. It can also be easily towed behind a regular pickup truck or van thanks to its small overall footprint and trailer mounted design. Other features include hydraulically powered stabilisers, a pneumatically operated brake and clutch system, a new 2 speed winch design and much more. Please visit Dando Duke Cable Percussion Rig for a full range of features and specification sheet.